I've been consumed with Super Saturday projects and details lately, resulting in no posts for awhile. But I am super excited to share everything--soon. Like many children, our Ella loves rocks. And they're all very special for different reasons. She has an extensive collection and can tell you exactly where each one came from. 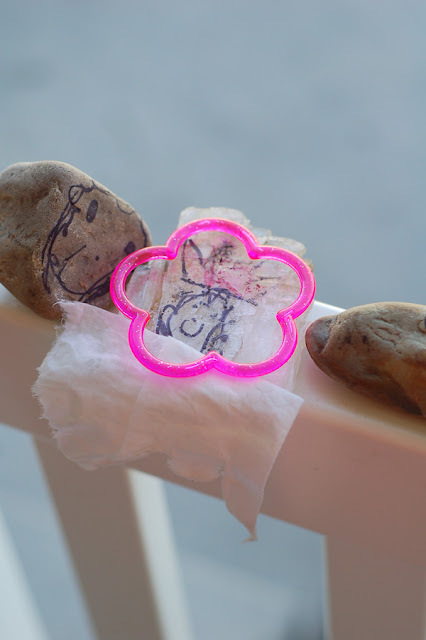 Last weekend, Ella created this family of rocks. There's me, her, Annabelle (Patrick and Ashlee's dog) Patrick (older bro), Ashlee (older bro's wife) and Dad. 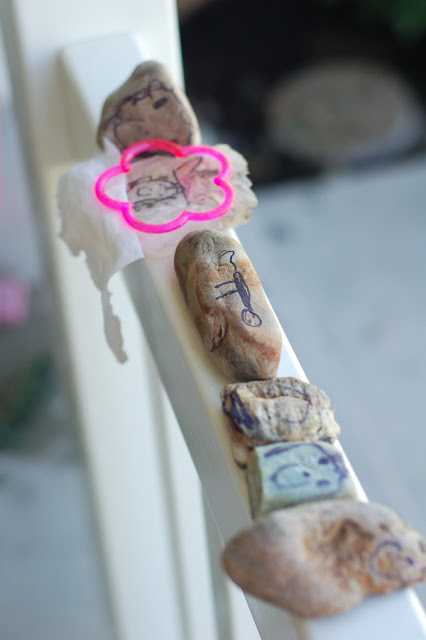 Speaking of rocks, here's a little sneak peek at one of the projects for Super Saturday. (I know, I can't wait.) 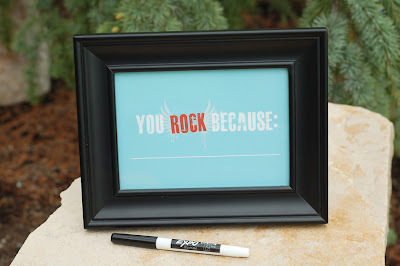 I created a series of 5x7 fill-able frame printables and this is one of my favorite. Place the print in a frame and use a dry-erase marker on the glass to write in the details. Just wipe it off (no water needed) and use it over and over. 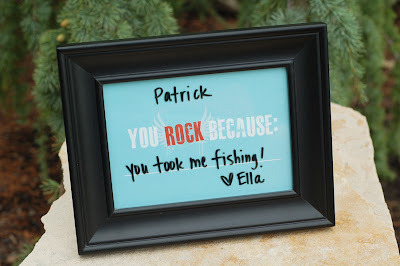 Originally Ella wrote the message, but I smeared it when I was carrying it with a bunch of other stuff. It was so sweet in her 6 year old writing. Ella adores her older brother, but she also blames everything on him. "What is that smell?" It's Patrick. "Wow, this is a big mess!" Patrick did it, not me. "Why is there no chocolate left?" Patrick ate it. Of course he's never around when it happens. It's hilarious. So I have an issue. Well many, but this one I'm willing to share. ;) Actually, it's more of a strong belief. 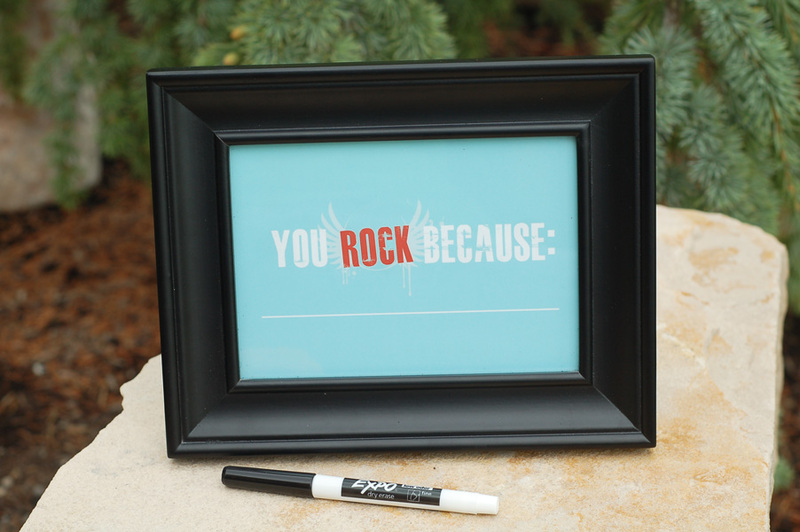 I've seen the "I *heart* you because" printable on blogs and Pinterest, and I think it's darling. But, (here's the personal issue/strong belief part) I spent too many years telling and showing my children, I love you no matter what. We had a saying--"I love you and there's nothing you can do about it." Oh my, did my children test me to see if I really meant it! So...when I see, "I love you because you cleaned your room," I struggle. There. Now you know. So I changed things up a bit. Remember, when you have this printed, make sure the "auto enhance" is turned OFF, otherwise the colors will be very, very different. 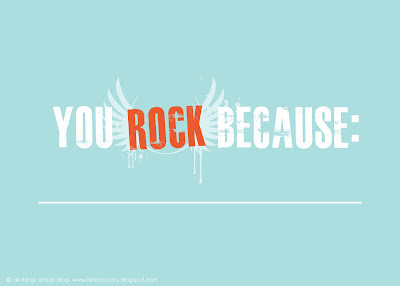 Let someone in your life know they rock. I agree so much with teaching your kids unconditional love & not undermining it with using love as a reward.